College Profile: The institute boasts of the State-of the Art facilities, well built infrastructure and a serene lush green naturally landscaped sprawling campus far from the hustle and bustle of the town, providing congenial environment for learning. 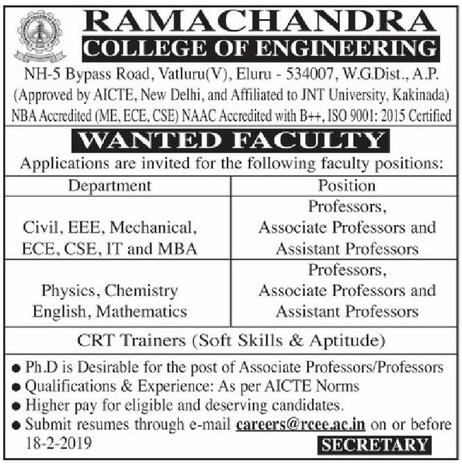 RAMACHANDRA COLLEGE OF ENGINEERING is a vibrant, forward looking Institution offering a high quality learning experience with a welcoming and friendly environment. RCE aims at establishing academic credibility as an Institution offering dynamic UG Engineering programs, Industry Interface, Research and Consultancy. RCE has a team of highly experienced, well qualified and dedicated faculty members in all disciplines. In addition, RCE organizes guest lectures by eminent professors, experts from industry to the students in their respective areas of specialization. Scale of Pay : Very attractive pay based on AICTE norms with all perks for eligible selected candidates. How to Apply: Interested candidates send their letter of interest and detailed resume through Email to the Principal of the college.